The album marks the band’s ATO Records debut, arriving after more than a half-decade’s worth of international touring, communal living, and shared songwriting sessions. It’s a timely – and timeless – version of a sound that’s existed for 50 years, ever since pioneers like the Grateful Dead and the Allman Bothers Band blurred the lines between rock, country, and amplified folk music. 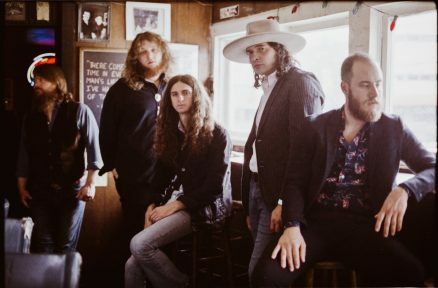 If That Santa Fe Channel nods to the band’s influences, though, it’s still a fiercely unique album, recorded in a series of live takes that shine a light not only on Cordovas’ songwriting chops, but their strength as a raw, rugged live band, as well. That Santa Fe Channel was produced by the Milk Carton Kids’ Kenneth Pattengale in East Nashville, not far from the home that doubles as the band’s rehearsal space, headquarters, and shared living quarters. There, in a converted barn behind the property’s main house, the guys logged countless hours fine-tuning a sound that’s already earned praise from outlets like NPR Music and Rolling Stone, who described the group as “the harmony-heavy, guitar-fueled house band at a Big Pink keg party in 1968.” With its western wooziness and siesta-friendly swagger, That Santa Fe Channel also nods to the band’s other home bases: Southern California, where bassist and band leader Joe Firstman lived for years; and Todos Santos, Mexico, where Cordovas’ five members travel every winter to write new songs, sharpen old standbys, and oversee the acclaimed Tropic of Cancer Concert Series. The result is a record that’s steeped in – but not limited to – southern sounds and California charm. It’s American music without borders. Years before Cordovas’ formation, Firstman traveled the country as a solo musician. Raised in North Carolina, he moved to Hollywood as a determined 20 year-old, signing a major-label deal with Atlantic Records in 2002. His debut album, War of Women, hit stores one year later. When a dizzying blur of acclaimed shows – including opening dates for Sheryl Crow and Willie Nelson – weren’t enough to satisfy the expectations of a big-budget record label, Firstman lost his contract and took a new job as music director on Last Call with Carson Daly. It was good work, with Firstman performing nightly alongside first-rate musicians like Thundercat and Kamasi Washington. Still, the need to create his own music was ever-present. With Cordovas, he’s found his ultimate vehicle: a collaborative band with multiple lead singers and a collective approach not only to songwriting, but to existing. Cordovas aren’t just bandmates. They’re roommates. They’re co-conspirators. They’re a family. Living in such close quarters – both at home and on the road – has turned Cordovas into a band of brothers. Stop by the band’s East Nashville compound and you may find Soria and Weaver picking their way through bluegrass songs inside the barn, while Firstman wraps up a family dinner in the kitchen and Spillman fixes the band’s RV outside. There’s a communal vibe to the band’s existence that bleeds over into their songs, where it’s often hard to pinpoint a single person’s voice in those thick, swooning harmonies. That Santa Fe Channel is the soundtrack to that communal existence: a collection of songs written together, performed together, and lived together.